Under the red sky of Mars lives an enigmatic man named Ken. Not a single person alive knows who he is, why he’s on Mars, or why he looks just like Miss Ken Minakami. In a whirlwind of gunfights, horseback chases, and utter lawlessness, Captain Ken sparks a time of change. The townspeople seek to rid themselves of the corrupt Mayor Deven (who doesn't give a whit about anyone else), and the Martians wish to reclaim the cities that were once their homes. Stranded in a prison full of enslaved Martians, Ken must get himself out, or all is lost. 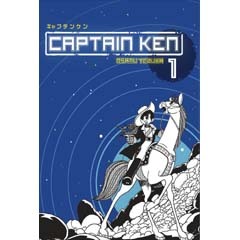 From the creator of Astro Boy and Blackjack comes an epic sci-fi western on Mars starring Captain Ken and his trusty steed, Arrow. Captain Ken is an enigma. Not a single person alive knows who he is, why he's on Mars, or why he looks just like Miss Kenn Minakami. His presence sparks a revolution—while the Martians seek to reclaim the lands stolen from them, human townsfolk aim to rid themselves of the corrupt Mayor Deven. Amidst the whirlwind gunfights and horseback chases, Captain Ken must go on his greatest adventure yet to save a woman of great importance in the middle of a Martian revolution.